How can I keep incoming phone calls from interrupting my recording? Can I quit or push the 'Sleep' button immediately after sending an email? Where can I find a list of all the emails that I have sent? Long recordings. Is there a limit to the length of my voice memos? Sending a voice memo to someone in your Contacts list. Responding to an email from someone who is not in your Contacts list. Including a picture in your email, along with your voice memo. 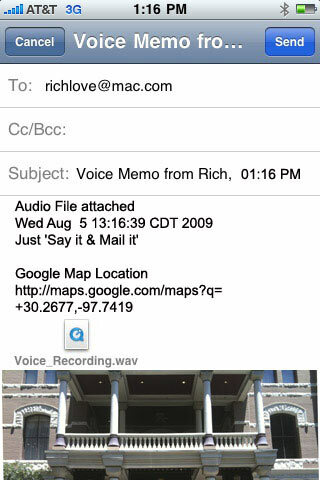 Including a Google map link in your email, along with your voice memo. Emailing a screenshot to someone, along with your voice memo. Send an MMS Instant Message to another iPhone. What does my email do when I send it to another iPhone, PC or Mac? * iPod Touch requires headphones with microphone and a Wi-Fi connection. (email will be held in the Mail Outbox until email can be sent). iPod touch does not work with Auto Email. When you tap the 'Info' button, you will see the screen shown above. Using the two autofill fields at the top are optional. They will save you a lot of time emailing recorded messages because the information from these fields will be automatically filled for you. You only need to do this once - just set it and forget it. Enter your name in the first field. It is used in the 'Subject:' line of the email. For instance, the 'Subject:' line will be: 'Voice Memo from John, 08:25 AM'. Without your name, it would just be: 'Voice Memo, 08:25 AM'. In the second field, enter the email address that you will most often use when sending voice memos. 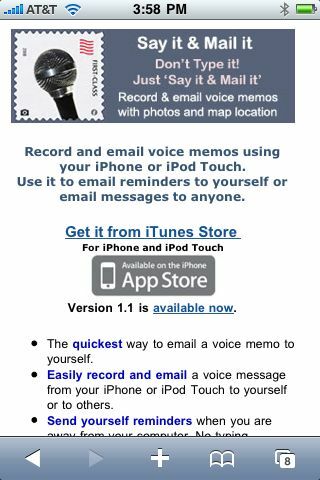 If you frequently send voice memos to yourself, then enter your own email address. This entry is autofilled in the 'To:' field of the email, which is a great time-saver. Note that when you are sending mail, you can easily delete the autofilled address whenever you want to send your email to a different person. 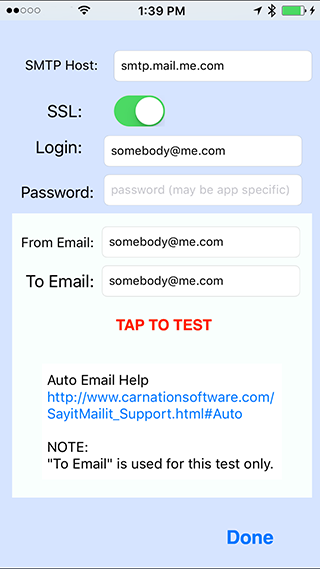 PRIVACY NOTE: Carnation Software does not use your email address for anything. In fact, we will not have any way of knowing what the address is - it is stored in a private place on your iPhone or iPod Touch. Your voice recording can optionally be converted to text with the iPhone 4S. Instead of tapping the microphone to record, just tap "Mail it" and then tap anywhere in the body of the email to show the keyboard. Then tap on the microphone icon in the keyboard and start recording. Tap Done and your speech will be converted to text. When you send email, it is sent from your default email account. If you only have one email account on your iPhone, you don't need to worry about this setting. But if you have two or more, you may find that mail sent from Say it & Mail it is sent from a different account than you want. You can easily change the default mail account. This is actually a function of the Mail app. Then tap on "Mail, Contacts, Calendars". Scroll down and tap on "Default Account"
Change the account to the one you want. NOTE: Auto Email uses a different method to send mail. When you send email, it is sent from your default email account. But if you have multiple email accounts, you may occasionally want to send mail from a different account. Here's how to do it. When you tap "Mail it", an email window opens up and there is a field called, "Cc/Bcc, From:"
Tap on that field and you will notice a new field appear below called "From:"
Tap on that field and you will get a selection wheel to select the account you want to send email from. 1. Tap 'Say it' to start recording. If you make a mistake while recording, just tap the 'Stop it' button and then tap 'Say it" to record your memo again. (The 'Say it' and 'Stop it' buttons are the same button. You will notice when you are recording that the button changes to 'Stop it'). When you hold the iPhone to your ear, recording will start. When you move the iPhone away from your ear, recording will stop and the email window will automatically open. You can shake your iPhone or iPod touch to start and stop recording. Shake in a quick windshield wiper motion. It only takes one quick shake. (recording starts or stops when you stop shaking). The email window will pop up when you stop recording. Then just tap send if you are sending the memo to yourself. Otherwise, change the email address to another address. 1. Allow Shaking to start & stop recording. 2. Include "Just Say it & Mail it" in the body of the email. 3. Map location always used. 4. Map screenshot used when possible. 5. Include "file attached" info for audio, photo & map. 6. Start Recording when this app launches. They are in the Sent folder of the Mail App. Exit 'Say it & Mail it' and then tap on the Mail Icon to launch the Mail App. Then tap on "Mailboxes" and then "Sent". All of the email you send with 'Say it & Mail it' are in the Sent folder because the Mail App is actually the app that sends your email. 'Say it & Mail it' just tells the Mail App what to send and who to send it to. Keep in mind that you are emailing the voice memo as an attachment. For each minute of recording, your audio file will be about one megabyte. There are several things to consider when sending large file attachments. 1. Can the person receiving your email receive large file attachments? If they have a Pop account, they are most likely limited to a certain file size attachment. Could be a 5 MB limit but depends on the ISP they are using. If you send it to someone with an IMAP account, the file sizes allowed are much larger. Apple's mail is IMAP. Google can be either IMAP or Pop. 2. It takes longer to send an email with a large file attachment. If you are connected to a wireless hotspot, no problem. But if you are on a slow edge connection, it could take forever. 3. If the mail fails to send, it will be in the Mail app Outbox. Version 1.6 of 'Say it & Mail it' has an elapsed time counter so you can watch your recording time as you speak. NOTE: Make sure you remember to stop the recording and email it before you quit. If you push the home button to exit the app before stopping the recording, you will most likely loose your recording. First, delete the autofill email address in the 'To:' field (unless you also want to send to that person). Then click on the blue-circled plus (+) icon to show your Contacts list. Tap on one of your Contacts (we will use "Magic Widgets" as an example). Now you can see that "Magic Widgets" is in your 'To:' field and you are ready to tap the 'Send' button. Scenario: You have just received an email from someone who is not in your Contacts list. 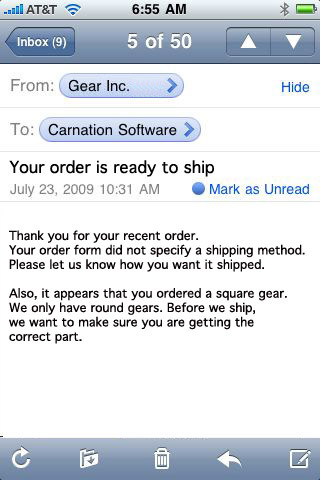 It is from Gear Inc.
You ordered a gear from them but they need more detailed information before they can ship the part. The screenshot below shows what that email might look like in the Mail program. 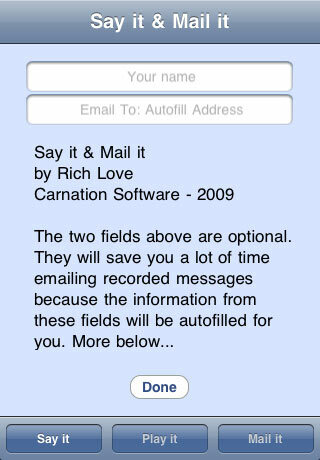 Instead of hitting 'Reply' and trying to type out a long, detailed message on your little iPhone or iPod Touch keyboard, you can use "Say it & Mail it" to respond. But first you need to add their email address to your Contacts list. 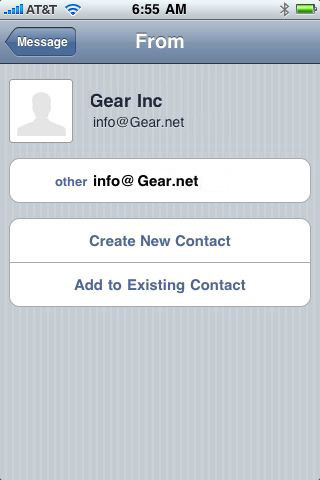 First, tap on "Gear Inc." in the 'From:' field. Then Tap on 'Create New Contact'. Now quit out of Mail and run "Say it & Mail it." After you prepare your voice message in "Say it & Mail it", you can select your new contact, "Gear Inc."
NOTE: You also have the option of copying text from this email. Tap and hold on the text and then tap 'Copy". 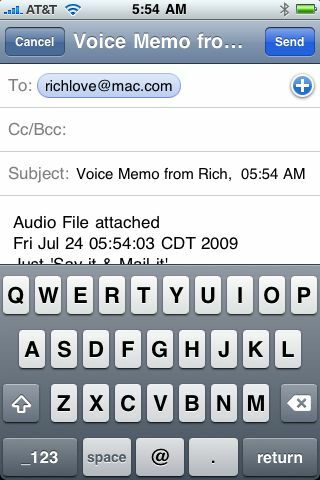 Then before you send your voice memo, you can tap and hold in the body of the email and select 'Paste'. NOTE: Before sending your recorded message, this is when you can paste your previously copied text (from the email you received from Gear Inc.). Tap the 'Camera' icon to include a picture, along with your voice memo. Your photo will appear in the window, as shown above. You can move the sliders to adjust the picture size and quality that will be used in your email. You can email a full resolution photo by moving the Max Size Limit slider all the way to the right. Note that the sliders do not affect the original photo on your iPhone. You will notice that the 'Camera' icon now has a green outline around it, confirming that your picture will be used in the email. 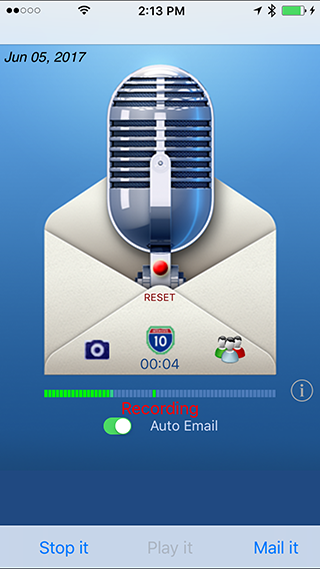 Now you can record your voice memo, then tap the 'Mail it' button. NOTE: You can record your message first if you wish, and then tap the 'Camera' icon. It does not matter which order you use (camera first or recording first). The photo remains until you clear it or quit the app. So you can keep sending the same photo and voice memo to different people if you wish. Or you can record a different voice memo and send the same picture. Note: for your privacy, map location services will not be used until the location switch on. Tap the 'Map' icon to include a Google map link, along with your voice memo and picture. Then slide the switch to the ON position. You will see 'Waiting for Accuracy' in red text. When the accuracy is 350 meters or better, it will say 'Ready' in green text. It will also display a map of your location. You can review the map to confirm that it is the correct location before sending your email. If you wait a bit, you will usually get an accuracy of 17 meters with an iPhone. Tap 'Done'. You will notice that there is now a green outline around the 'Map' icon to indicate that the map location is ready and will be included in your email. When someone receives your email with an iPhone, they will be able to click on the link to launch the Google map application, see your location and get directions. When someone receives your email with a Mac or PC, they will be able to click on the link to launch their browser to see your location and get directions. For your privacy, the location link is not included in your email unless you slide the switch to 'On'. When you quit "Say it & Mail it", the switch will revert to 'Off' by default. You must switch it 'On' each time you run the app. This prevents you from inadvertently sending your location to someone by mistake. * NOTE: The iPod Touch can only get a map location when it is connected to a wireless hotspot that is registered with SkyHook. http://www.skyhookwireless.com/howitworks/submit_ap.phpThis limitation is beyond our control (just the way the iPod Touch works). The iPhone does not have that limitation since it uses cellular service to get the location. When you tap on 'Mail it" you will see the screen above. Notice that is has the Google Map Location link, audio file and picture in the email. You can take a screenshot of any screen in any application on the iPhone or iPod Touch. For instance, I took the above screenshot from Safari while visiting www.SayitMailit.com. Simply hold down the 'Home' button, press the 'Sleep' button, then release both after it flashes the screen and makes a camera sound. The screenshot will be saved in your 'Camera Roll'. Now you can send the screenshot along with your voice memo by tapping on the camera icon in "Say it & Mail it" and selecting the screenshot from the 'Camera Roll'. 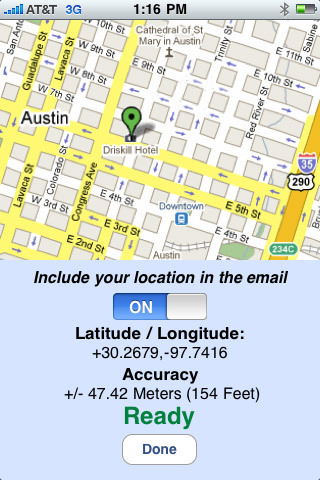 You can send an email to someone at their MMS address and it will pop up an instant message on their iPhone 3G or 3Gs. 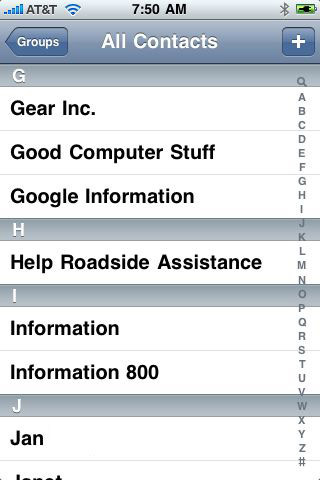 Audio, photos and map are all supported on the iPhone 3G or 3Gs. iPhones prior to the 3G do not support MMS. However, you can still send MMS email from an older iPhone to the newer 3G or 3Gs using 'Say it & Mail it'. (where xxxxxxxxxx is the phone number of the iPhone you are sending to). Oh, and one more thing. There are no MMS charges on your iPhone when you use 'Say it & Mail it' to send a message. (the person you send to could be charged depending on their carrier plan). You can optionally email to a group of people or favorite person. 'Say it & Mail it' will use the groups you already have set up in your contacts. First record your voice message. If you want to include a photo, tap the camera icon and take a photo or select a photo from the album. To make a favorite person show up in the list, you simply make a group with one person in it. (where xxxxxxxxxx is their phone number). You can create or edit groups in iCloud Contacts. Refer to this article. Your iClould groups will automatically appear in Say it & Mail it on your iPhone and iPad. If the picture is small, it will display it automatically without tapping on the icon. If a map was included, the map will be displayed and if you click on the Google Map Link, it will launch the iPhone Map application to let you use GPS to find the location. When you send an email to an instant message address, an instant message will pop up on the iPhone screen of the person you sent it to. When they tap View, they can then tap on the voice recording icon to listen. They can also tap on a picture. The audio play button is visible in the body of the email and the photo is displayed. If a map was included, the map will be displayed and if you click on the Google Map Link, it will launch the browser application to show you a Google Map where you can zoom, show Road Map or Satellite Views and get directions to the location. If you send email to a PC with Windows XP, the audio and video files are attachments that you need to double click on. If you send email to a PC with Windows 7, the audio and video are visible in the body of the email. Turning on map location services. For your privacy, map location services will not be used until the location switch on. Tap the map icon in the main window to open the map location window. Then slide the switch on. The switch will remain on as long as 'Say it & Mail it' is running. When you quit, the switch is turned off the next time you run the app. NOTE: Starting with version 1.4, the switch turns on automatically when you tap the map icon. You can turn it back off if you wish. With Auto Email, you can Say it and then Mail it. This is an in-App Purchase option. Slide the Auto Email switch to the ON position to purchase. Note: It is best to use your Apple Mail account settings. If you must use Gmail, refer to Gmail Password here. To open the Auto Email Settings Window from the main Say it & Mail it screen, tap on the info (i) icon. Then tap on Preferences and then Auto Email Settings. If you are using Apple Mail, all of the fields in this window will be filled in for you except the password. Enter the password for your Apple Mail. NOTE: If you have Two-Factor authentication enabled in your Apple Mail account, then you will need to create an App-Specific password to be used here. You need to log into your iCloud.com account with your browser to create an App-Specific password. Click on Apple ID, Manage (you will be prompted for you user ID and password. It will ask you for a password label. Just enter Say it Mail it and hit return. The new password will be displayed. Enter that password in the Password field of the SMTP window shown below here. You should get a test email that says Email Sucessfully sent. The "To Email" field is used for testing only. The "From Email" field is used for testing and when you send voice memos with Auto Email. The SSL switch is normally on. This provides a secure sockets layer of protection when sending mail. Version 10.0.6 or later has a Self-signed switch. This is normally off. You should only turn this switch on if your server uses a self-signed certificate. The SSL connection is less secure when the Self-signed switch is on. The Login field is the user name or Email address for your mail server. The SMTP Host is the mail server you are using to send mail. You can change this if your mail server is not Apple mail. Just make sure that your Login and password are correct for that server. You cannot use .iCloud or .mac as the smtp server. Your Login might be somebody@iCloud.com and that is OK.
We recommend that you use Apple Mail to send email when using Auto Email in Say it & Mail it. It turns out that in order for Google to authorize a third party server to access your account via SMTP, you have to enable “Less Secure Apps” on your gmail account. You can read a full explanation of what risks that subjects you to, and get a full explanation here, but essentially, any apps that aren’t using security protocols that Google deems mandatory, will be blocked unless you enable the ability for less secure apps to access your gmail account. We won’t recommend that you allow less secure apps to access your gmail account, it’s currently the only way Io allow Say it & Mail it to use your gmail account to send outgoing mail. If you do choose to enable less secure app access, you can do that on this page in your gmail account. You may intermittently get an error when sending Auto Email. This is normal and it happens when there is no outgoing SMTP server connection. Just tap on OK and then tap Send. Your email will be held in the Mail app outbox and will be sent as soon as there is a connection to the outgoing server. 1. You have airplane mode turned on. 2. You are in an area where you cannot get a connection to the internet (traveling on the road in a remote location or inside a building where there is no cellular. 3. The SMTP server is temporarily down. 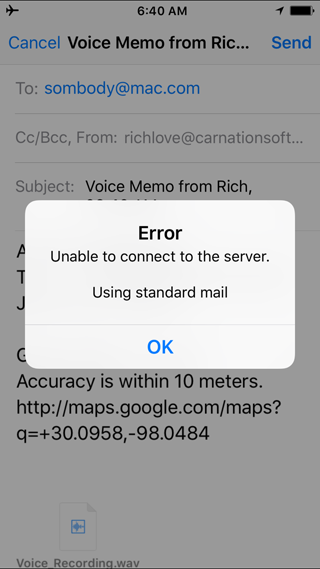 Failed to Logout or Incorrect 'From Email"
You will get this error when the smtp server returns an error 550. It is probably caused by the From Email you entered in the Auto Email Settings. Most likely, the From Email is not in the same domain as your Login email or is not a valid email. Note that the From Email needs to be a valid email for your smtp server account. Copyright 2009-2017, Carnation Software. All Rights Reserved.